Your child should go to bed and get up at a similar time every day. A regular routine is very important. On weekends or days off, try not to extend his waking hours too much. 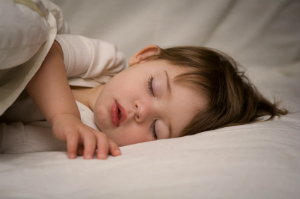 Develop a pre-sleep routine: bath, brushing teeth, pajamas; kiss goodnight and a bedtime story. Do your best to protect his sleep time. Ask family and friends not to call after a certain time; the rest of the family should try not to make any noise. Your child should - and not only for a good night’s sleep - exercise regularly. However, avoid heavy exercise within three hours of going to sleep. He shouldn’t go to bed hungry; a light snack will help but don’t put him to bed if he has had a heavy meal within three hours of sleep. Your child should not read, watch TV, eat or play video games in bed. Your child’s bed is meant for rest. Go to bed and get up at a similar time every day. You need to have a regular routine. On weekends or days off, try not to extend your waking hours too much. Develop a pre-sleep routine: Take a bath, brush your teeth, get dressed for bed, read a few pages of a book. Try relaxation techniques such as meditation or progressive relaxation. Protect your sleep time. Ask family and friends not to call after a specific time. The rest of the family should be quiet when you go to bed. Exercise regularly but avoid heavy exercise within three hours of going to bed. Dark (eye shades, room darkening shades). Quiet (turn off cell phones and pagers, use ear plugs if needed). Don’t go to bed hungry, but don’t eat a heavy meal within three hours of sleep. AVOID working, reading, watching TV, or eating in bed. Your bed is meant for rest.